Twin-wire binding with strong wire bar for easy wall hanging. 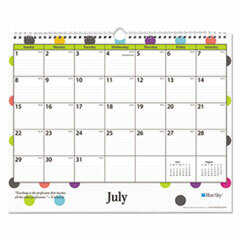 Kick off the academic year with bright, colorful designs to match your busy, colorful classroom! 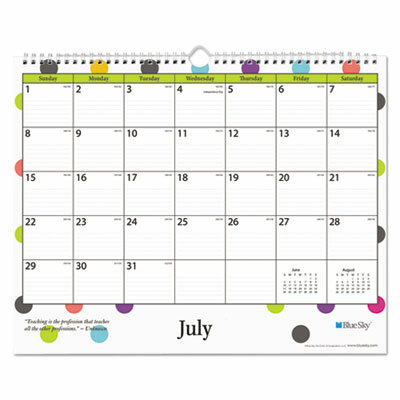 The Teachers Dots wall calendar will help you and your students stay on track with dated monthly views for scheduling flexibility at every glimpse. Daily lined blocks and past and future month blocks on each page. Twin-wire binding with strong hook mount makes for easy wall hanging. Thick, premium quality paper reduces ink bleed-through. Also features a motivational teacher-inspired quote on every page! Seasonal Availability: Yes Size: 15" x 12"